Last Saturday, Sawyer was with friends at his 8th grade graduation trip to Universal Studios, our piano and guitar lessons were cancelled, and Aaron was busy with the business. 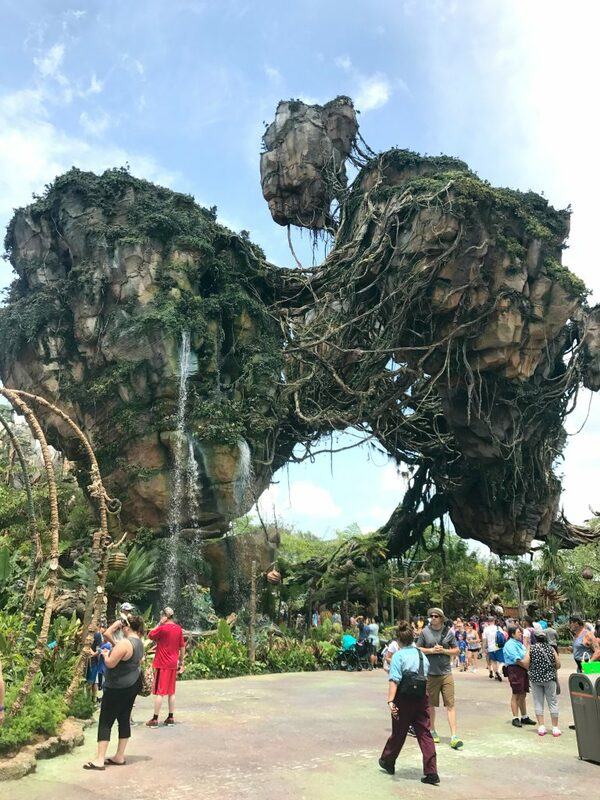 This gave Nova and I the perfect opportunity to head up to Animal Kingdom to check out the new world created by the Disney Imagineers– Pandora, from the movie Avatar. We really wanted to ride the Flight of Passage ride and decided to just go. We told ourselves we would be willing to wait in line for two hours for the two new rides but no longer. We have been to Animal Kingdom so many times, we really just wanted to see what was new. 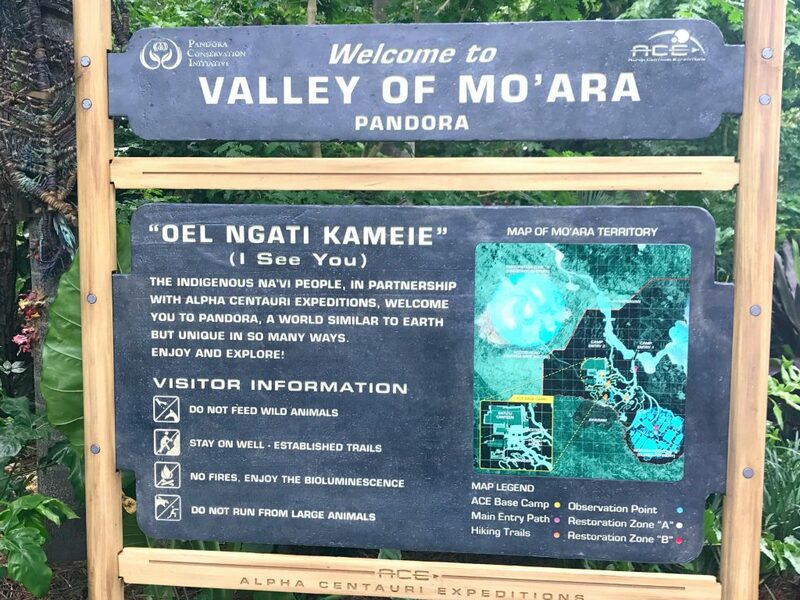 As soon as we got there, we headed straight to Pandora. It was beautiful. Floating mountains. Waterfalls. Really cool plants everywhere we looked. It is just pure beauty and awe-inspiring. Na’vi River Journey was first on our list with an 110 minute wait. It really didn’t feel that long though (and of course, we forgot to check our watch when we got in line). The line kept moving, there were neat things to see and plenty of fans to keep people cooled off. The ride was beautiful—it really felt as if you had entered Pandora. One of the coolest parts was the animatronic Avatar near the end of the ride. It was so well done—I thought for sure it was a person in costume. The ride was only so-so. It was very pretty but there was nothing extremely special about it. It will be great for kids of all ages, even the very youngest because there wasn’t anything remotely scary about it. No drops, very slow moving. Was it worth a two hour wait? I wouldn’t do it again but I’m glad we went on it. As soon as we got off the ride, our friends were waiting for us to check out the more thrilling ride, Flight of Passage. Luckily the wait had gone down from earlier in the day and it was also only 110 minutes. But after standing in line for over an hour, announcements came over the speaker to warn us that the wait time was going to be longer than anticipated. We had already sensed that since the smooth moving line seemed to have stopped moving for an awfully long time. We contemplated…should we stay and wait? How long could it possibly be? We tried to watch YouTube videos of people who had waited in line to get a sense for how long it would be. It seemed to go on forever. We weighed our options and decided that since we had already invested over an hour we would wait it out. The girls were entertained. We played games. We chatted. We complained. And the queue is loaded with things to see, especially as you get closer to the ride. Finally, after three hours, it was our turn. The set-up for the ride seemed kind of long but it was done so well that we were all getting more and more excited at each step of the process. On the ride you are paired with an Avatar and you ride a Banshee (dragon like creature) through the world of Pandora. There is a lot of time getting linked to your Avatar and learning about the process. Once you are paired and the ride truly begins, you are in for the time of your life. The world is so beautiful and the sounds, the smells, and the sensations really make your brain think that you are there, in Pandora, flying. I don’t know how they do it but this ride is somehow able to pull out genuine emotional reactions that I’ve never seen on another ride. I finished the ride with tears streaming down my face from pure joy. It was incredible and definitely worth a three hour wait. If you stay at a Disney Resort, you can score your Fast Passes 60 days in advance. Otherwise, Fast Passes can’t be acquired until 30 days out from your Disney vacation. Have you been to the new Pandora? What did you think?